And with his predilection for putting multiple runners on base in most of his outings I'm not sure you'd want him coming in with the bases loaded anyways. Kimbrel's career WHIP is 0.920. Last year it was 0.995. Heck, I would have settled for a guy that could actually hit the zone let alone get outs. At least make them earn the runs! I agree with the above statement that we are going to have major issues once we have to start utilizing a 5 man rotation. I am trying not to overreact to a 10 game sample size but this article makes me think we are in for a long season of poor pitching performances. Of those listed above, Romero is really the only player that gives me any hope. It makes the decision to utilize Romero as a RP all the more curious as he could have provided at least #4 SP numbers for us this year. As it stands, we have 3 guys we can trust. Gibby will better. Pineda has been fun to watch, however I wonder if he will be on an innings limit or wear down as the season goes on. Berrios looks like this could be his coming out party. Ordo looks like he should be the long man out of the BP, given his track record of success the first time through a lineup. Perez looks awful so far. It is frustrating (as many have pointed out) that we made no effort to address our pitching this offseason. I am a big fan of the FA acquisitions to the lineup but we aren't going to playoffs by winning shoot outs every night. 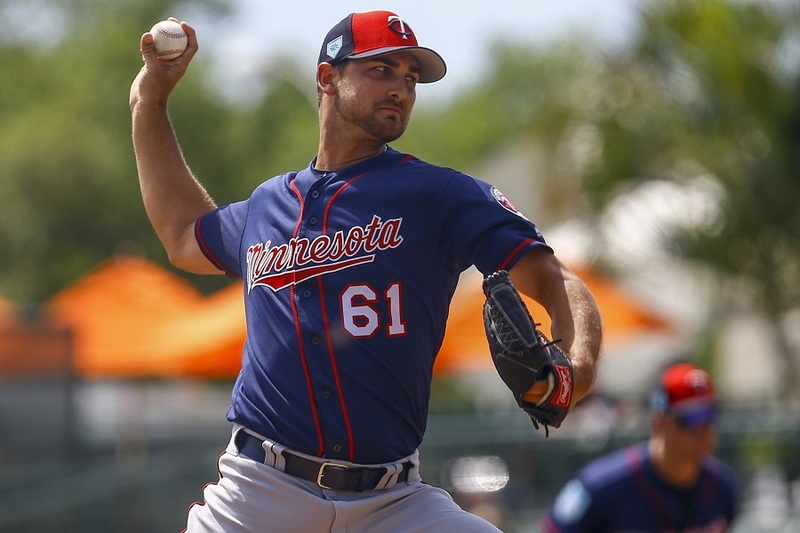 I wouldn't want to give up on Vasquez already, but even with all the strikeouts, the guy still was only throwing 90 MPH last year when he was up with the Twins. If that's what we are to expect from his velocity, I'm not going to expect great results from him at the MLB level. With Perez going to the rotation I think Stewart or Romero should be added to the pen, they'll need multi inning guys. Or they could skip AAA and get Cody Stashak from AA. One of my personal favorites and a guy who typically goes multiple innings. I don't think he's in AA because he needed remedial work, I'd guess it was because there were just too many options for Rochester and he didn't have seniority. While I wish we would, I can at least understand why we won’t sign Kimbrel at the price he’s asking for. However, if we don’t sign Keuchel, who’s said he’s willing to take a 1 year deal, than we should send just Mejia down to AAA where he and Romero can get stretched out because I’m really starting to doubt the quality of our rotation. I never trusted Perez as a starter in the first place, since I believe he’s better suited for the pen, but Odorizzi and Gibson?? If we can’t rely on those two, beating Cleveland seems highly unlikely, especially when Lindor gets back. If the FO wants to improve the pen without having to sign Kimbrel, than I recommend that we either sign Madson, make a trade for an established reliever (Givens, Bradley, Conley, etc), or even speed up the timeline for some of our system’s promising bullpen arms like Moran, Quezada, Smeltzer, Stashak, Colina, and maybe even Alcala. Trevor May leads the league in several Statcast categories.He has the lowest Average Exit velocity against with 76.5MPH.He has the lowest hard hit% with 5.6% (only allowed one hit above 95MPH).His Barrels/Plate Appearance is 0.0%. Between May, Rogers, Hildenberger, and Parker it is clear that we have no need for Kimbrel or any other closer candidate. Our bullpen is fine. Hildenberger optioned, Vasquez outrighted/DFA'd; Eades and Romero up. In four days: Stewart's starts in Odorizzi's spot, Odorizzi to the pen, the least effective reliever with options down. I don't care if it's little league or major leagues.If you cannot throw strikes you don't belong. Lots of strange decisions.I feel like the Romero experiment is like the Sano to the OF experiment.Let Romero start and get him up here.Odorizzi is now in his second year of proving he cannot go more than 4 innings.Rookie relievers need to get settled and DeJong and Vasquez got crushed instead.Then there is the Ehire pinch hit with Nelson Cruz on the bench.So much to confuse this old brain. I agree, you just have to roll the dice with Romero. He's off to a decent start, just give him a chance. There's a high ceiling and he honestly can't be worse than what's happened already. I agree on 3 of those 4, but disagree that our bullpen is fine. We need depth. The problem is that to win games we are going to have to over pitch Rogers, May and Parker. Hildenberger is a depth guy - he's frankly not that good, lets in most of the runners he inherits, but he's good enough to be the # 6 or 7 guy in a 7 man bullpen. Good enough to be in MLB, not good enough to be an important cog in a contending team's bullpen. We only have 3 of those guys. We need 4 or 5quality BP arms PLUS 2 or 3 depth guys. We have 3 quality arms in May, Rogers and Parker, and 1 depth guy in Hildenberger IMHO. I think Odorizzi could be a "quality" BP arm and Perez a depth/maybe quality guy. Maybe Harper or Morin finishes off the group now, with Eades, Romero and/or Littel coming in a month or two for anyone who isn't effective or the inevitable injuries. Sooo, I would move Odo to the BP and leave Perez there, and send Vasquez down. Now we need two starters. If we're going to sign a FA, sign Kuechel on a 1 or 2 year deal (he now says he'll take that) for one guy. Bring up Stewart as the #5 starter. If no Kuechel or while he's building up arm strength, add Romero or Littel to the starting rotation. I'd vote Romero but I don't know where he is in terms of innings, etc. To me, the better plan to make the less effective starters into relievers where they may be more effective and take our chances with young starters. That's where we have some talent, not in the bullpen. Hildy just walked one guy last night, otherwise has been solid. No need to blow everything up after 10 games. We're 6-4 man. This is what Odorizzi was last year. 5 innings and he's done. A number 5 starter. Gibson and Pineda have only the ability to go about 5 right now also, though due to health. Prepare for an overworked bullpen, injuries, and an exposed lack of depth. The majority of starts in MLB last year were five and one third..... Pitching has changed. That's a misleading stat. Yes, pitching has changed, but that's not totally why average innings per start is what it is. For 1 the Rays really throw the number off with their "opener" usage. They averaged just 3.9 innings per start, but that misleads as their actual starters were much better than that. Cleveland averaged over 6 innings per start because they have good starters. The problem with the Twins current pitching situation is that they built it to have starters who can go 6 and then have 3 lock down guys and 1 or 2 other guys who can fill in in their bullpen with just a couple random dudes to be the long and blow out guys. But their starters haven't nearly filled their role and it's put way more pressure on the guys who weren't supposed to be used often. When Berrios starts and then you can just get into a mix of Parker, May, and Rogers things look good. But when Odo and Gibson come up way short on expectations it forces Rocco to use guys in situations they weren't meant to be used in. Every reliever, on every team, will end up pitching important innings. You can't just use the top 3 day after day and expect them to carry the load. Even if Odo and Gibson go 7, you still need bullpen coverage on those days, and every day the Twins play. Using only the top end in every close game is unworkable. Good bullpens have multiple good arms, because all arms get used, and used in situations that matter. Demanding more from the starters is a nice thought, but that was going to be difficult to achieve for this year's Twins team. However, adding bullpen arms was simple. I'm with you on May. I'm a fan of Rogers and Parker has looked better from his first couple of shakey outings but the jury is still out. Hildenberger? Maybe, I'm still on the fence after last year. But even if all four of those guys are good to great, there's always room for bullpen improvement, ask the A's last year. Let's start with 90 wins as our goal. Let's say we only get 6 innings out of our starters in all 90 of those games. That means we need 270 innings worth of bullpen usage in those games. If you have 4 guys who throw all of those innings they're all throwing 67.5 innings. That's obviously a ridiculously perfect situation, but that's the plan you build for when you're a small to midmarket team because it's not sustainable to pay bullpen guys big money because they're too volatile. The argument I made in my post was you want 3 shut down type guys to lock down sure wins. Then you have 1 or 2 others are quite reliable. That's 4 or 5 guys. Yes, every guy in the pen will throw innings, but the plan is to use those 4 or 5 in the "important innings." Good bullpens do have multiple good arms, 3-5 of them. They don't have 8 guys that they expect to use regularly in high leverage situations. They have 3-5 and then pop some of those other few in there in the 6th or 7th in stretches where the team is in a bunch of close games. But that's only a few stretches of the season. Vasquez was brutal last night, yes. But to act like the bullpen is just collapsing right now is inaccurate. Harper, Hildy, and May haven't allowed runs yet. Rogers and Parker have allowed 1. That's 2 runs in 21+ innings. That's your 4 guys you're counting on at the end of games and 1 random guy. The expectation is that Romero will come up and be a 5th end of game guy. What else do you realistically want from a bullpen? This article and thread have people acting like the season is over because some random dude the team was never counting on came in and was absolutely brutal in 1 game. But in reality the bullpen is doing it's job. It's not doing the extra stuff the starters are forcing it to try to do. Trevor May leads the league in several Statcast categories. He has the lowest Average Exit velocity against with 76.5MPH. He has the lowest hard hit% with 5.6% (only allowed one hit above 95MPH). His Barrels/Plate Appearance is 0.0%. 4 guys isn’t enough. They can’t all pitch every night there is a lead to protect. Vasquez deserves more chances, hopefully we don't make a habit out of bringing in rookies with the bases loaded to face the top of the order. That was not a good choice in hindsight.I'm not giving up on De Jong after one bad inning either. Pitching depth is a major strength for us this year.It's not front of the rotation/back of the bullpen depth but we have good depth.If Berrios, Pineda, and Gibson stay mostly healthy and pitch decent we have nothing to worry about. Hildenberger should be a fine bullpen piece.He has battled inconsistencies in his first 2 seasons but I am confident he will have a good year. No signings, no trades (until July), this is our squad.Leave the rotation (with Perez) the way it is until an injury occurs.Our offense will be great and our pitching will be fine (average). No reason to give up on Vasquez, but also no reason to have him learn on the job in MLB when we have a team that can contend. Let him learn more in AAA, he's spent almost no time there. Sending him down isn't giving up; it's actually helping him improve for a potential call up later. We have better options in Morin and Romero and better ones coming off the IL in Magill and Moya - guys who have proven they can get MLB hitters out (Reed may be toast). I can't see a good reason to keep Vasquez up when there appear to be better options. Hildy just walked one guy last night, otherwise has been solid. Jake.Reed.He's not the end-all-be-all answer, but he deserves a freakin' shot.Going on 5 years from AA & AAA with solid numbers and no MLB opportunity is sickening.